Since Dearly Beloved and I don’t get to see our grandsons as often as we’d like, we’re grateful that our daughters are pretty faithful about keeping us in the loop about their sons’ activities and what is going on in their homes. Sometimes a simple photograph. . . .
That banana looks very out of place! I can so relate..and I only have one. Who ever thought I would be saying no dirty socks on the table while we are eating or please don’t clean your finger nails with a dinner knife..or one time a long time ago to a boy who should have taught me about boys..We were at Popeye’s chicken when I look over and notice my 4 year old godson licking the table…horrified I asked WHY. He calmly told he like honey. I don’t see a problem there. 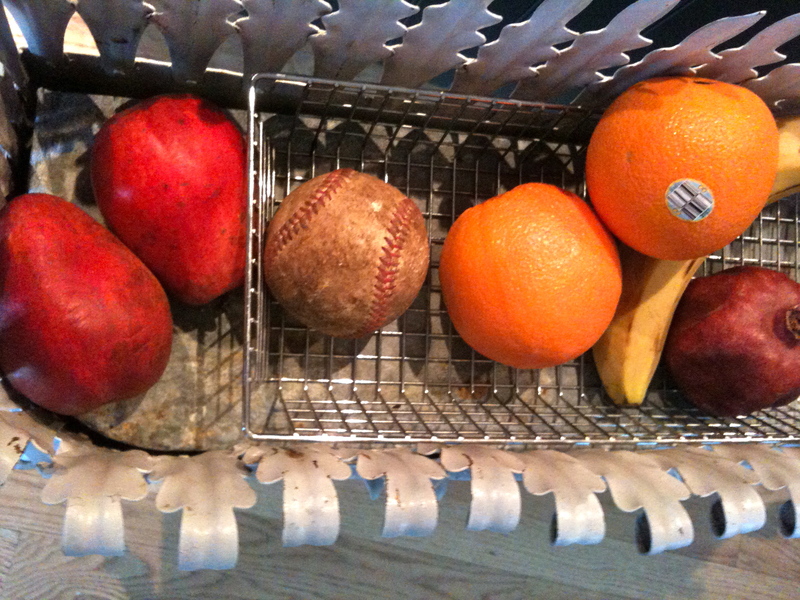 The baseball is not touching any fruit that is eaten with the peel on it. And heaven knows your brother isn’t likely to be looking in the fruit basket for anything so it’s a great hiding place. You have a lot of smart-aleck friends. So, I need not say a thing. I agree with all and just love that the baseball has been so obviously used. It does belong. Well, obviously, it’s the orange with the bar code sticker. I miss Sesame Street. When my daughter was little, it was the one she asked for every day, even though she couldn’t pronounce S’s. Thank you so much for your words of comfort and understanding. She very much believed in the Rainbow Bridge and I desperately want to. I vote for the banana!